The Federal government funded public housing, but  local government made decisions about building design  and project location. 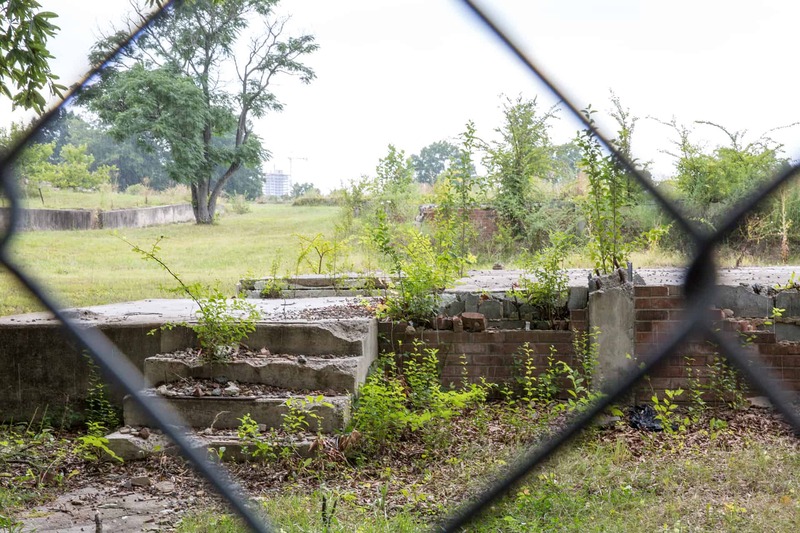 Durham’s first projects were segregated, with Few Gardens for white people just east of Edgemont and McDougald Terrace for Black people east of NCCU. While public housing was initially a big improvement in residents’ lives, the promise of public housing as safe, decent, and affordable housing did not last long. Newly completed Fayette Place housing project is shown with the Durham Freeway under construction in the background, 1967 (above). Durham’s public housing stock was cheaply constructed, poorly maintained, and quickly deteriorated from normal use. Fayette Place was demolished forty years later and remains vacant today (right). 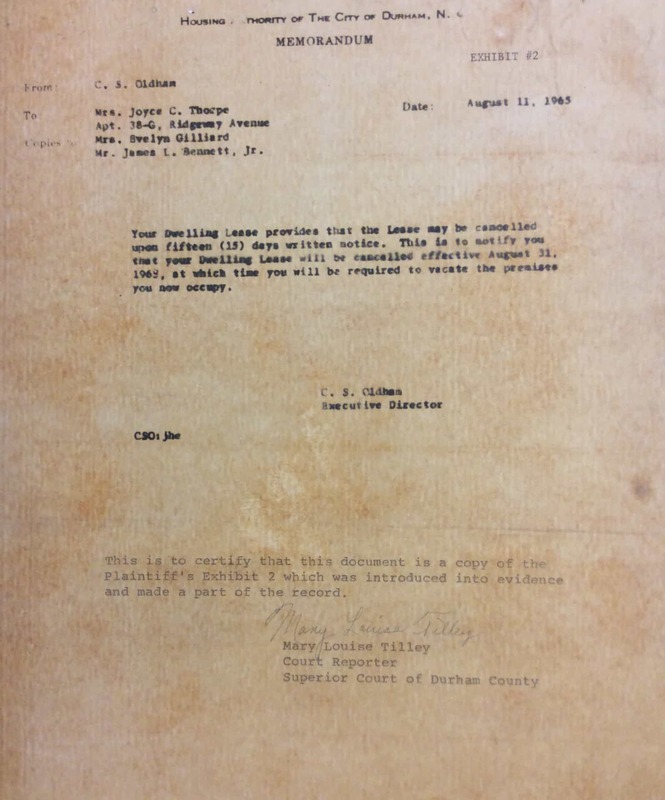 The Durham Housing Authority had huge control over residents lives, including the ability to evict residents without notice. In 1965, Joyce Thorpe challenged the eviction from her home in the McDougald Terrace project and her case went all the way to the Supreme Court. They ruled in her favor, creating new laws that prohibited local housing authorities from evicting public housing residents without cause. 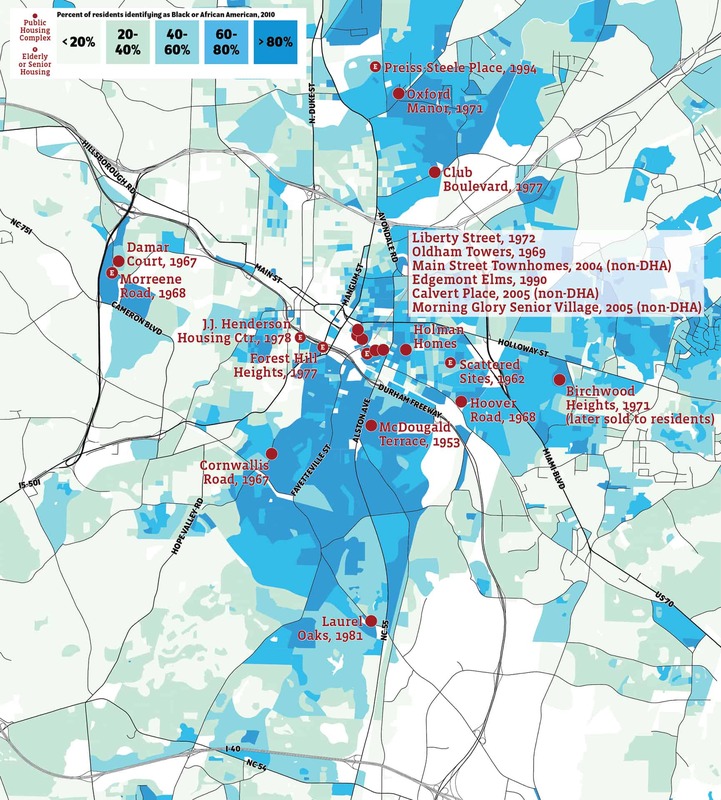 Notice how public housing projects are concentrated in Black neighborhoods in southeast Durham, cutting off residents’ access to other parts of the city. This video examines the history of the Fayettville Street Public Housing Project from its origins as a housing for people displaced by urban renewal to the present. Completed by Dillon Leovic, 2016. Newly completed Fayette Place housing project is shown with the Durham Freeway under construction in the background, 1967 (above). Durham’s public housing stock was cheaply constructed, poorly maintained, and quickly deteriorated from normal use. Fayette Place was demolished forty years later and remains vacant today (below).